Gambler Lures started out over 20 years ago with a mission to make the best bass fishing lures on the market. And they've certainly succeeded – Gambler can claim multiple BassMaster Classic Championships for their lures, and tons of other top tournament finishes. But they don't just make bass lures. As Gambler has increased in prominence, they've added more versatile offerings, focusing on inexpensive softbaits with smart design and plenty of customization, that can be rigged in almost any way imaginable. Their offerings range from spinner jigs and weedless swimfishing jigs to stickbaits and jerkbaits, and a large variety of diverse "creature" jigs. Their lures are appropriate for just about any application, with a diverse lure selection that contains products appropriate for anything from saltwater trolling to small lake, freshwater shore fishing. Their products have even expanded to fishing accessories such as knives, tackle boxes, and apparel, among other accessories. But we’re not interested in that. No, what we're here to do is take a look at some of the very best lures that Gambler has to offer. Ranging from spinners and spoons to swimbaits and a huge selection of diverse jigs, this list of products is sure to have something that'll catch your eye, whether you're a seasoned bass angler or just a beginner learning to jig and rig for the first time. One of the most unique lures that Gambler has to offer, the Mean Fishing Jig combines a shad-style body jig with a spinner that’s complete with a shad-head. This realistic design is in contrast to most spinners and bladebaits which feature no natural designs at all – they’re only shiny metal, designed to lure in prey from afar. And while those types of baits may lure them in, they often fail to produce strikes. Not so with this jig – the flashy bladed tail of the spinner brings them in, and the natural rubber body of the jig seals the deal, catching your prey firmly on the quality Gamakatsu hook. It's also easy to jig with and use as a dropbait – the double-sided design keeps the blade profile and shad bait vertical in the water and ensures that you'll always get the right angle for your strikes, and the natural soft plastic behaves realistically in the water, swaying back and forth with both the actions of the rod and the currents, while the spinner flashes wildly to bring in bass and other fish from far and wide. 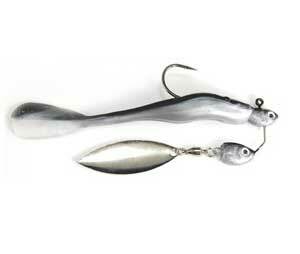 This is a great lure to go with if you’re beginning to jig, or learning other vertical fishing styles. It’s a great combination of realistic design and high-tech spinbait style, and its efficacy is only matched by its ease-of-use. It's versatile, too – you can either fish it jig-style with a drop-and-retrieve method or employ a standard cast-and-retrieve method like you would with a larger crankbait or standard spinner. Given its small profile and durable design, this lure is especially good for fishing among weeds and rocks, and other small, hard-to-reach areas where you may not be able to employ a larger jig or lure. Rigged up to sink, it’s got a great falling presentation, and it’s very responsive to motions from the angler, so you can make it dance between rocks and weeds easily and effectively, and don’t have to worry about losing it due to its small size and streamlined design. This lure is versatile and unique, and since it can be used both for jigging and dropbaiting as well as standard cast-and-retrieve methods, and can be used in adverse weather and water conditions, it’s highly recommended to help fill out your tackle box. If there's one style of lure that Gambler is known for above all others, it's their weedless swimfishing jigs. These jigs combine great craftsmanship, flashy skirts, and smart, weedless design to create swimfishing jigs that are a pleasure to use. Stick a worm or a swimbait on the end of the Mustad hook, and the skirt will protect it as you fish in even the rockiest conditions, and even through plenty of muck and weeds. Once you rig it up, there are plenty of fishing options for this lure. 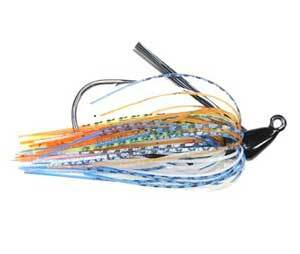 The best way to run it is as a bottom-water swimfisher jig, as combined with an appropriate bait, it creates a ton of dust and commotion along the bottom of the water that’s sure to catch attention, and it rarely gets snagged even in adverse conditions, so it’s consistent and easy to fish with. Its versatility is what really earns it high marks. It can be rigged with just about any bait, ranging from gigantic swimbaits up to 10" to smaller grubs, crawdaddies, and just about any other soft bait, or even live baits. For that reason, it's a great addition to any tackle box for those who love bottom-water jigging or those who are interested in doing so in the future. If you're not into jigging, don't worry. Gambler has plenty of other bait offerings, like these soft plastic swimbaits crafted with a segmented tail and natural profile, perfectly designed for a great presentation when it's swum at just about any speed and depth. It can be rigged with either a belly weighted hook, or a screw-in weight, depending on your needs, and its soft construction means that it can be used with just about any hook. When reeled in quickly, the segmented tail flaps wildly from side-to-side, kicking up plenty of water and vibration, and when it’s reeled in slowly, there’s subtle, realistic side-to-side swaying motion that’s irresistible to fish. Combine that with its great sinking action, and there are plenty of opportunities for strikes on this bait, no matter how you choose to fish it. That’s why we love it – rigged properly, it’s useful as a drop-and-retrieve bait, or with faster, more consistent reeling techniques. No matter how you choose to use it, it presents naturally and draws in plenty of prey, and it’s customizable to just about any need, given its soft, hookless construction. The ways you can fish it are pretty much only limited to your imagination, (and your rigging gear) so we think it certainly deserves a place in your tackle box. 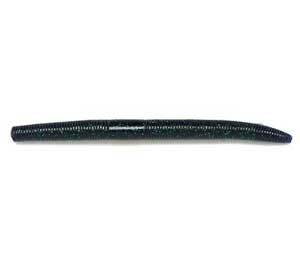 Gambler is also known for making some of the best worm stickbaits/jerkbaits on the market today. 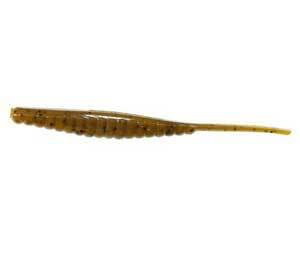 This specific Ace Worm is designed for a natural falling action that falls at a perfect, natural rate, and presents with a squirming motion that is as realistic as it is attractive to fish. It’s best fished in either a Texas or Carolina rig, depending on your surroundings – if you’re in weedy waters, you may want a Texas rig so that the hook isn’t exposed to the weeds and won’t catch. If you’re in deeper, weed-free waters, a Carolina rig is the way to go. You can even combine this worm with Gambler’s Rat’Lin Weights, which come in a variety of weights and sizes for all applications, and combine a great, all-brass construction with some added vibration which can help bring in fish during tougher conditions, or from farther away. Once you've got it rigged, it's pretty much up to you how you want to fish it. These baits are very responsive to the motions of the angler, and when you jerk them around, they present with a great, natural profile to fish in the water and produce plenty of strikes. And given their value and the multiple color options, you'll always have the right one for your water and weather conditions, and won't have to worry if you lose one to an especially harsh bite. This is another one of Gambler’s top products, and it puts a unique spin on classic jigging and dropbait techniques. 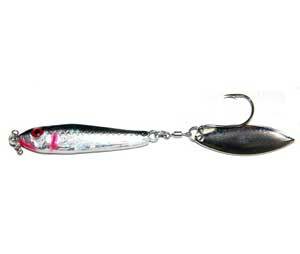 Paired with a giggy hook, this lure has been designed with a “hollow-tail” body that keeps it oriented vertically within the water, and gives it a unique, natural presentation in the water. Tie a drop shot weight on the end, rig it up to stay about 2-3 feet off of the bottom of the water, and you’ll swear that this thing is magic. How you fish it from there is up to you – some prefer a jigging/jerkbait style where you twitch the rod around, causing the bait to dance around and react to your motions, and the motions of the water current. 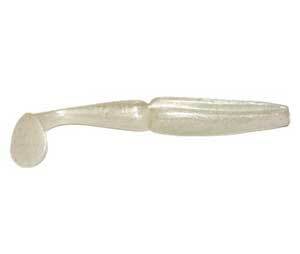 Others prefer to drag the bait, causing it to move actively and consistently a couple feet from the bottom. What you prefer to do is up to you – this bait can handle it all. Drop shotting is a great technique to learn, and if you’re interested, this is a perfect lure for it. The great thing about drop shotting is that it can be done just about anywhere, including really murky, weedy, or rocky waters, due to its mostly stationary technique.​ So whether you’re a drop shot master, or don’t even know what we’re talking about (here's a good beginner's guide) you’ll love this bait, combined with Gambler’s top-quality giggy hooks. This is only a sampling of Gambler’s offerings, and we’re sure that if you keep on poking around, you’ll find a Gambler bait that’s perfect for you. They’re an industry leader when it comes to soft bait (and the hardware you need to rig them up) and they certainly get great results. These lures are also relatively low cost compared to hard plastic lures, so they’re great if you want to beef up your tackle box with versatile swimbaits, jigs, dropbaits, and stickbaits, but don’t want to spend your kid’s college tuition doing it. So check out these products, learn more about Gambler, and find your next favorite lure.